This marijuana stock skyrocketed on Tuesday and Wednesday, driven by U.S. midterm election results and Attorney General Jeff Sessions' resignation. Cronos Corp. (NASDAQ:CRON) stock declined 33.3% in October, according to data from S&P Global Market Intelligence. But it's already up 32.2% in November, through Wednesday, thanks largely to a 9.7% jump on Tuesday followed by an 8.4% leap on Wednesday. Cronos is a Canada-based marijuana grower. 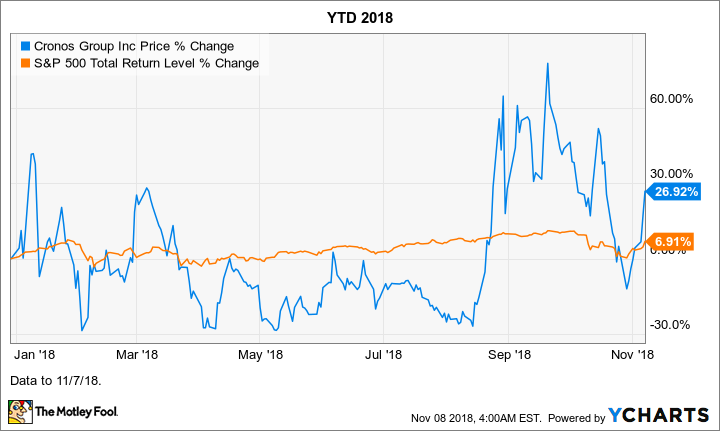 We can attribute Cronos stock's drop last month to the marijuana sector in general pulling back after running up considerably during the late summer in anticipation of Oct. 17. That's when marijuana became legal for adult recreational use in Canada. Cronos stock's powerful start to November can largely be attributed to two related catalysts in the United States. On Tuesday, results from the U.S. midterm elections (in which the Republicans kept control of the Senate and lost control of the House) expanded the size of the legal marijuana market and arguably bring the country one step closer to legalizing cannabis on a federal level. Michigan voters gave the green light to adult recreational use of marijuana, making it the 10th state (along with Washington, DC) to do so; Missouri legalized medical marijuana; and Utah legalized the substance for people with qualifying illnesses. On Wednesday, U.S. Attorney General Jeff Sessions resigned. More accurately, he left under pressure from President Donald Trump, with whom he publicly had a difficult relationship, as is being widely reported. This news came out via a couple Trump tweets yesterday afternoon soon before 3 p.m. EST. Soon after, most marijuana stocks took off, with Cronos gaining 8.4% for the day. The reason cannabis stocks partied as if the Wicked Witch in the Wizard of Oz were dead is that Sessions is a marijuana foe to the point that some feared that he could crack down on the possession and/or use of the substance in U.S. jurisdictions where it's legal for medical and/or recreational use. Since cannabis remains illegal on a federal level in this country, he technically had the power to do so. Cronos has several ties to the U.S. market, which is probably why its stock reacted particularly positively to the above two catalysts. In September, for instance, the company announced a partnership with Boston-based Ginkgo Bioworks to produce cultured high-purity cannabinoids from engineered strains of yeast. Additionally, it's also teamed with California-based MedMen Enterprises to open high-end retail cannabis stores in Canada. 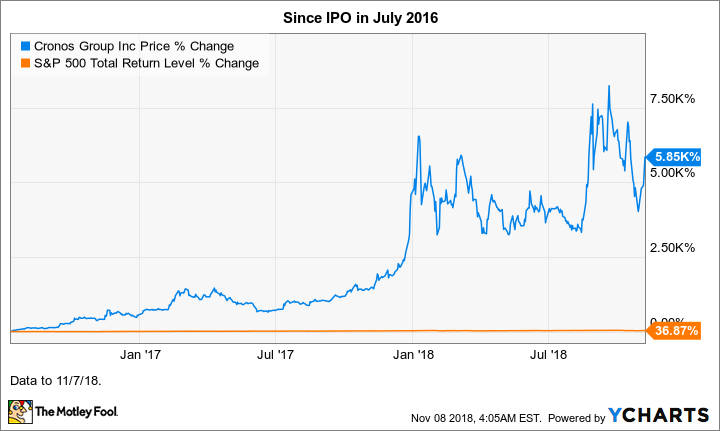 For context, here's how Cronos stock has performed so far in 2018 and since its initial public offering (IPO) on the Nasdaq in mid-July 2016. Sessions' resignation removes one notable hurdle holding the U.S. back from legalizing cannabis on a federal level. This is certainly positive news for companies that have their sights set on getting a piece -- or a bigger piece -- of the potentially massive U.S. legal marijuana market. Cronos investors should monitor the Canadian recreational marijuana market launch, as stronger-than-expected early sales could boost its stock. They should also keep an eye out for announcements of any partnerships with big companies. Caution remains the name of the game, particularly with respect to pure-play marijuana stocks, such as Cronos. These volatile stocks are suited only for investors with higher risk tolerances.